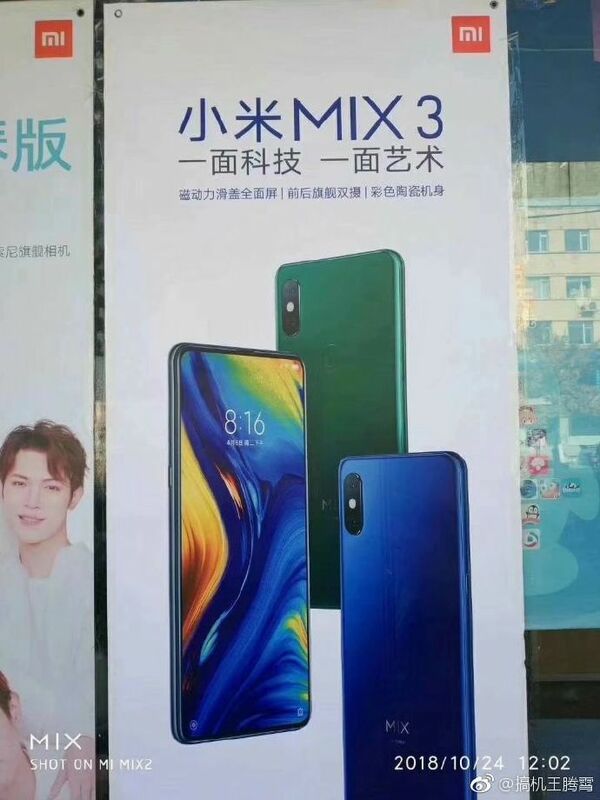 Xiaomi Mi MIX 3 Leaked Poster Reveals Blue, Green Color Variants with Rear Fingerprint Scanner - Playfuldroid! A leaked poster of the Xiaomi Mi MIX 3 has appeared from China. The image has revealed the blue and green color variants of the smartphone. The image reveals that the Mi MIX 3 phone is equipped with a rear mounted fingerprint scanner. The above image seems to have been shot from a shop in China. Previous leaks have revealed that the Mi MIX 3 will be arriving in Emerald Green, Sapphire Blue and Black color variants. The above poster has also revealed the key features of the Mi MIX 3 which include full screen slider design, front and rear flagship cameras and colored ceramic body. Multiple rumors have claimed that the Mi MIX 3 will be equipped with an in-screen fingerprint scanner. However, the leaked poster is a clear proof that the handset will be arriving with a rear-mounted fingerprint sensor. There is a possibility that there will be a Pro or Screen Fingerprint Edition of the phone that will be equipped with an under-display fingerprint scanner. The handset is expected to arrive with a 6.4-inch AMOLED screen with FHD+ resolution, Snapdragon 845 chipset, up to 10 GB of RAM and up to 256 GB of inbuilt storage. For photography, it is expected to arrive with 24-megapixel dual selfie camera with LED flash and new pair of dual rear cameras that will be enabled with support for 960fps slow-motion video shooting. It may arrive with a battery of 3,850mAh capacity.